Discotech is an app that allows you to search, discover, and RSVP to the hottest clubs, lounges and live music events—it's the Kayak.com for nightlife. Before Discotech, the only way to get into the best clubs was through club promoters—middlemen who get paid on commission and take their large cut of fees. With Discotech, you can now browse through dozens of clubs, book your tickets, and enjoy the night seamlessly. Formerly in Private Equity at Bain and The Gores Group. Speaks fluent Mandarin with a degree from Berkeley in Business and Industrial Engineering. Founder of online lead gen company. Formerly at Zoosk. Alum of Univ. of Hong Kong and Berkeley. Formerly at image sensor architecture and design company Ambarella. Engineer at Zoran. Intern at NASA’s Ames research center. Berkeley alum. Ian and the team at Discotech have developed an innovative, revenue-positive business. The team has disrupted the large nightlife category and is poised for growth. They are great at UI and growth hacking. They have also pivoted well to include nightlife ticketing. Founded in 2012 by three UC Berkeley alumni who were tired of being exploited by club promoters, Discotech serves as a one-stop "virtual concierge" that helps users find events, buy tickets, book tables, and RSVP for guest lists. I've never met a team that hustles harder than Discotech. These guys know their problem, know their market, and are relentless in building the relationships and products that will solve a two-sided pain point. And as they gain scale, their two-sided platform only becomes more valuable and defensible. Discotech is so easy to work with. They provide quality general admission guests and table reservations on a consistent basis.Their technology is easy to integrate with and their back end is built to data-mine important customer information. On the consumer side, their app is fast, easy and reliable. The customer service they provide the nightclub goer is second to none, and is a great representation of our standards. We love working with Discotech! Normal guy looking to invest and be financially secure. The 65,000 clubs in the U.S. depend on club promoters: middlemen who take their cut of the pie and operate primarily through word-of-mouth. These 100,000+ individual promoters are difficult to manage, unreliable, and impossible to scale. We've grown our club partnerships over 50% in the last year and had 5,000 new registered users in June alone. 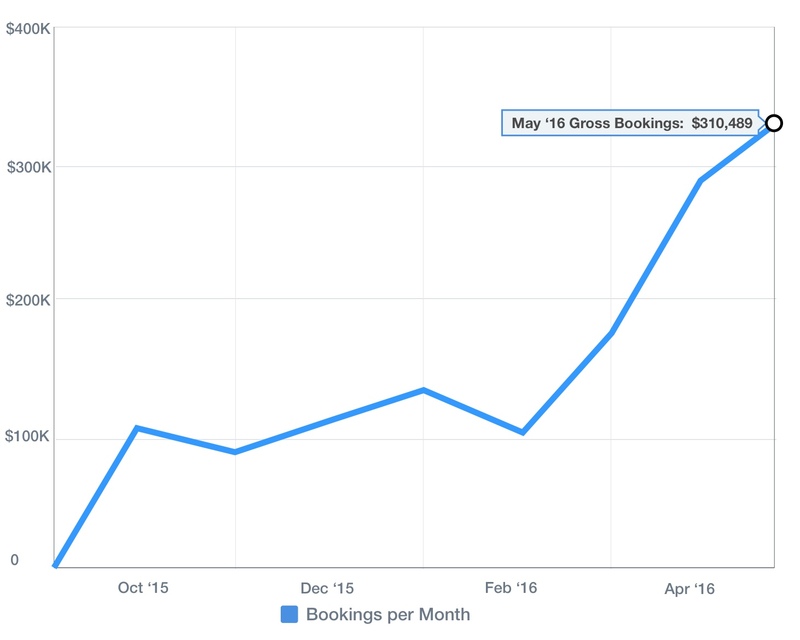 And we've doubled our booking amount since 2015, of which we earn up to 20% on commission. We’ve partnered with the best clubs in the U.S. We have 7 of the top 10 clubs in the country. Just download Discotech and browse the most popular nightclubs in Las Vegas, Miami, Los Angeles, and San Francisco. The nightlife space has long been plagued by inefficiency and non-transparent pricing. As avid nightlife customers, we here at Discotech have firsthand experience with the frustration and disappointment that comes with promoters and the traditional nightlife system. From these negative experiences, we realized there was an opportunity for a technology-driven company to streamline the process and bring transparency to nightlife. Over the last few years, our team has validated the concept and we have proven that the business is viable. By focusing on delighting our customers, we have grown past 65,000 registered users - primarily via word of mouth. In March of this year, we were able to achieve monthly break-even, and our revenues have continued to grow month over month since then. We have demonstrated that our model works, and now we are looking to scale the business by increasing our marketing and improving the platform via a larger engineering team. Going out with your friends is fun, however planning a night out is anything but. At Discotech, we believe that the nightlife industry is overdue for disruption and that a technological overhaul will solve the major problems in this space. We invite you to join us now as an investor and help us bring about the much needed change in this industry! We're taking nightlife from promoters and putting it back in the hands of club owners and their avid customers. It's a win-win scenario for both customers and clubs who are now finally able to track their guests and aren't losing money to dispersed middlemen. What Kayak.com did to travel agents, Discotech is doing to club promoters. We will be the mobile ticketing platform handling every entrance into the $26 billion U.S. club market and beyond. We are building the OpenTable for nightlife. Our mobile app allows users to discover events, purchase tickets, and sign up for VIP guest lists at nightlife venues in different cities. We are tackling the inefficiency and non-transparency that has been plaguing the nightlife space. People currently have to go through these nightclub promoters, traditional middlemen who are very hard to get in touch with and aren’t professional or very transparent when it comes to pricing. Our app makes it a lot easier for our customers to get the information they need, like accurate pricing, and ultimately, to make reservations very quickly without having to find these promoters, call them, text them, and go through a laborious process.Promoters get paid on commission. They’ll charge more if they know that the customer doesn’t know any better, just so that they can make more money out of it. Discotech is about working on a large scale and getting the lowest price possible for our customers. We save them money, make things easier, and we really just want to streamline this process, which we think is long overdue. Not only are we a good solution for the end customer, who’s ultimately the paying customer for the club, but we also make things a lot easier for the nightlife venue which is actually something we learned after we set out to do this. Clubs find promoters to be a pain point. There are a lot of them, they’re highly fragmented, there’s high turnover, and their loyalties are not steady. We make it easy and streamlined for the club to source them with customers. We’re nonbiased and at the end of the day, we’re much more professional to work with than different promoters calling and texting the club and serving as this inefficient middle man.Clubs leverage promoters as essentially their marketing team for the most part. Promoters are valuable because they’re the ones who have contact with the customers; they’re the ones who go out and do a lot of the marketing. Most clubs are mom and pop shops who don’t have a very sophisticated marketing teams so they develop this relationship with the promoters where they go out, bring in revenue, and make a commission on that.When promoters do rent out an entire club, these promoters still rely on other promoters to fill their venue because just like the club owners, they want to maximize the number of people in the venue so that the event is hot. They want make money on the people coming in because ultimately that’s what they’re getting paid out on. In these situations, Discotech maintains similar operations where our app helps them increase traffic to their venue through our end users.On the customer end, it’s a huge pain point for a customer without contacts to find out what’s going on, to know what’s hot in town and how to get access to those events. That’s magnified if you think internationally as well. We’re only focused domestically but imagine going to a foreign country where you don’t speak the language but you want to go out. Imagine how hard that process would be without something like this.Another problem that we’re solve for the clubs is that, in traditional methods, promoters go out and try to get people to come by putting them on a VIP list, but these people aren’t paying in advance. Clubs don’t know how many of those listed names are actually going to show up whereas with us, people are actually paying in advance. What do you have that traditional promoters don’t? There’s a lot that we do that traditional promoters cannot do. One of the main differences is access to data analytics that comes with our app. We’re able to see trends and analyze data based on which DJs are hot and which nights are good. We can do a lot more for the club in terms of these data analytics but we can also help them as a CRM system because we can reach out to our customers via push notifications which clubs cannot do themselves.We also work with clubs in Los Angeles to provide an exclusive loyalty platform where our customers are able to accrue loyalty points and, just like airline miles, exchange them for rewards. The clubs allow us to do this because they trust that we can keep accurate tabs on customer spending whereas a human promoter may not be the most trustworthy. How will you incentivize referrals? We don’t currently have a referral reward system but it’s something that is very high in our to do list. We really want to go the Uber and Dropbox route where customer can get rewards or get incentives for sharing Discotech with their friends and also for inviting people to the party and doing different actions on the app. The idea for Discotech really came to us as a team. We’re three guys from UC Berkeley, friends since college. None of us worked in the nightlife space so the idea came to us from the customer’s perspective. I think four or five years out of college, we were convening together in Las Vegas and we had spent a couple of hours tracking down different promoters and talking to them. We finally agreed on a price and then on the night of the event, we showed up as scheduled and we were told that our promoter had misquoted us. We don’t know this was an intentional bait and switch or if the promoter had just made a mistake.Either way, we were in a really tough spot. We actually ended up paying the extra amount that night but all the guys were just furious. We weren’t really having fun because we were bitter. While we were having drinks, we were just talking about how bad it tasted and it was really that experience that inspired us to search online to see if there was a company that was already solving this problem so that we as customers wouldn’t have to deal with this again.It was during that exploratory phase back in, I think 2013, that we saw there wasn’t anyone really solving this problem in a meaningful way by leveraging technology. We decided to do this as a side project at first. We built a demo for some of our friends and then got a lot of approval from the big nightlife players in Los Angeles where I was based at that time. It was from that point, we realized that this thing had legs and we quit our full time jobs and the team moved from San Francisco down to LA. We’ve been hustling ever since. Initially, when we started the app, we were focused on solving bottle service only so that target market was much smaller--typically wealthy males who spend a lot of money. We’ve since democratized the product, added on prefilled ticketing to our app, and also VIP guest lists. From there, we now target anyone who wants to go to a club at any point whether they want to get them for free, whether they want to pay for a ticket or whether they want to do the VIP bottle service which is the high-end package. We really make it accessible to everyone. Our demographics are split pretty evenly, slightly more men than women but it’s pretty close to 50:50 now. We see people of all sorts. From ages 21 to 35, I’d say is our target group but really people of all ages. The current market that we’re really focused on right now is nightclubs and lounges, however we also work with live music festivals such as Electric Daisy Carnival. If you look at some reports out there, I think the Nightlife Federation put out a report on the top hundred largest clubs and they’re doing about $1.5 billion in gross revenue. We estimate that our market in the United States is about $8 billion and around $25 billion globally. Of that $8 billion number, we estimate it’s about 80-85% due to alcohol sales, 60-65% of which is bottle service--the biggest segment. Then bar spend is probably around another 15-20%. The remaining difference comes from admission fees. Clubs are literally making more than half their revenue on bottle service. This percentage goes up for high end clubs.We’re already working with some bars, but not yet clubs or lounges. We’re also working with live music festivals like EDC, Ultra, Life Is Beautiful, Electric Zoo, some of the bigger EDM festivals that happen in America and so that’s a separate market all by itself and that’s somewhere we’re currently playing which impacts our adjustable market as well. How do venues use your app? To get on board the app is pretty straight forward. Once we give them the go-ahead, we simply need them to fill out a two-page Word document for us with all the information that we need. We then either work with the clubs or find pictures online ourselves to go live with the venue on our app and in regards to getting their events, we either scrape them directly from the event APIs, if they have them, or we have a scraper built that pulls them automatically from their website. I actually start the guest list because that’s much more simple for us to do it. Every club is slightly different but for the most part at a certain time, we provide the club with a list of names for the guest list and that list is literally printed out or the doorman will have it on an iPad and then as customers come in, they’ll get checked off the list and then they’ll be given free admission or discount admission--whatever that guest list perk should be. Bottle service works the same way. How does your app attract customers? We offer services that no other traditional promoter could. We have the most efficient, streamlined system out there and we give customers the experience of being treated like high status royalty. For example, in Vegas, because there are a lot of venues, we will actually provide the customer with a dedicated VIP host who will contact the customer and set up a time to greet them in front of the venue. The host will then walk them into the club so that they don’t have to wait in any line. They’re getting the highest VIP experience. At other clubs, we book tables for them. They’re in the system, and then when people show up at the door, they’ll check in with their first and last name and just pay at the venue. What can you do that traditional promoters can’t? One thing that we do that a traditional promoter can’t do is actually just sell tickets, pre-sell tickets. The incumbent way of buying tickets would be to go to different websites and checking out the prices and then purchasing them online. We make it very easy to buy tickets in a few clicks. The QR code is stored on the app so you don’t need to print anything out or find it in your email. This makes it very easy since there’s a scan at the venue that reads the tickets that you bought on our app. How did you guys start onboarding venues? We launched and started off in Los Angeles. From LA, we branched into Las Vegas which is the largest market in the United States. That was really done through the connections that we made here in LA. For Las Vegas, the team actually moved to a suburb of Las Vegas called Slumberland. We lived there for seven months. During that time, we on-boarded all the major players in Las Vegas onto our platform. The sale process initially was a lot more difficult. Getting the foot in the door wasn’t that easy when we didn’t really have traction in customers and customer referrals to back us up.Once we are able to get the foot in the door, the sales process is pretty straightforward. There’s really no risk for the club to be a part of our app because we don’t take an upfront subscription cost or a service fee. We only eat what we kill, the same way that traditional promoters do. For that reason, when we make the presentation to the clubs, they’re pretty receptive to us because they don’t really have anything to lose. I think we’re right now between 120 and 130 venues that are onboard the app. In addition to Vegas and LA, we’re also live in San Francisco, San Diego, Orange County, Miami and we’re starting to enter into other cities on the East Coast as well. In terms of number of venues, we’ve probably increased 50% over the last year. Adding venues onto the platform really isn’t our highest priority right now.We’re much more focused on getting users in the areas that we’re already in. In particular, we’re working on Los Angeles, which has really proven out to be a nice hub where we’ve achieved some kind of critical mass, and we’re starting to see a lot of organic downloads which is great. We’re really focused on gaining share rather than expanding without having the users that fall behind that.Month over month, we’re seeing more downloads. Last month, we, for the first time ever, broke 5,000 new registered users for June 2016. I believe our monthly active users is close to 16,000 off of a total install base of around 61-62,000 which we think is pretty solid.We also measure the unique number of visitors who come to our website so (www.Discotech.me). That number has also continued to grow every month as our SEO continues to improve. I believe those numbers are actually north of 34-35,000. We actually get more unique visitors to our website than we do to our app. Currently, we’re trying to funnel those people to our mobile app. Who acquires the user base? Historically, we’ve been doing all the grunt work. We started with digital marketing and guerilla tactics: going out to clubs and handing out cards. Once we had an initial feed of customers, they started talking and sharing it with their friends and now, all of our downloads at this moment and for the last number of months have been all organic. These are people searching for us on our website or just people spreading us through word of mouth because they like the product. Clubs today actually do offer us support when it comes to marketing so some of our good partners here in LA give us exclusive deals outside of the loyalty platform such as an exclusive guest list that’s only good for Discotech customers. One example would be Sound Nightclub which is a very prestigious and famous club in this country. On a number of nights, we’ll actually have a free one-hour open bar for our customers which, again, is exclusive to us. We provide them with Discotech wristbands to prove that they came in with Discotech and that helps us generate more buzz and more downloads. What’s the value per customer? 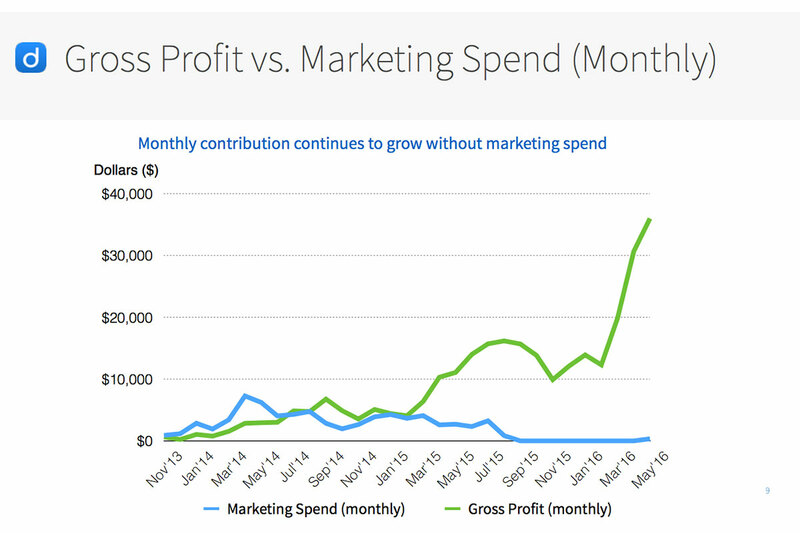 Our lifetime value is definitely greater than our customer acquisition costs. For our paying customers, it’s a pretty high customer value because bottle service is such a high value item. Our average tables price costs around $1,500-1,600, of which we’re doing a little better than 10% blended margin so those customers are generating a lot of value per user. How much do you guys make? As far as we know, it’s pretty comparable to what promoters make. Right now, we are much more focused on growing users and building relationships with the clubs rather than maximizing our cash flow. We’ve kind of taken what was given to us, and we’re usually making between 10-15% commission on the traffic that we bring in.On the revenue side, growth has been great. Year over year, I think we’ve grown over 3x from where we were. I think around January of this year, we were probably doing around $100k in gross merchandise volume a month and now, we’re doing over $100k a month. We’ve definitively come a long way and we see that number continuing to grow especially as we gear up to launch our web app which we think will show an increase in our metrics. How do you plan to grow and expand? For us, we haven’t really been leveraging digital and paid marketing just because we’ve been very conservative and lean as a startup. We’ve been bootstrapping it. Where we really see the growth coming in is as follows:Continue to invest in the product, building out social features because nightlife is ultimately a social activity. You never do it by yourself; it’s something you do with your friends and the ability to see where your friends are going, invite your friends to events or parties--these are all part of the experience. Building in a referral program is something that we think would supercharge this organic growth that’s really been taking off for us.We want to get back involved in digital marketing and paid advertising. One of my co-founder’s backgrounds was doing that for five years at Zeus which is the online dating site. We think that we can do it in a very calculated and efficient manner. Lastly, we think that hiring the right people to help with community engagement, management, and social media would also be a big help for us because currently, we don’t have the human resources to really take full advantage of that and that’s something we’d like to look into. Have you focused on specific types of nightlife venues? What’s the biggest challenge for you guys? The most important thing for us is getting the users. I think we got the club on-boarding part down, at least for now. I think the hardest thing is just getting the word out, building a brand, and communicating that brand to our customers. Once you have that initial critical mass, things definitely get easier because when you’re discovering Discotech from your friend, you’re much more likely to trust that brand and that product than if you just saw it on a Facebook mobile ad or a Google ad. For us, we want to do things that build a strong initial following and then grows off of that. We want to take the strategy that we’ve used in LA and apply it in the different new cities that we’re launching in. There are a lot of plays that we can do that don’t currently exist. For example, a “Hotel Tonight” type of play with last minute deals because ultimately, a club operates very similarly to a hotel. They have a lot of overhead but selling a table or selling a hotel room doesn’t really have any incremental costs for them. They’re all about filling up that inventory. With the right data and the right connection to the customers, we can help clubs fill out, unfold inventory and have dynamic pricing like Uber.We want to incorporate surge pricing based on demand and inventory remaining. I think that is a really cool opportunity that would be disruptive in the space. People might possibly even bid on certain tables with customers being able to bid down or up. That’s something that doesn’t really exist today. For us, we also just want to make it a one-stop shop where people from different countries can get on one app and just make it very easy for them to get information and get onto the platform.There’s actually a few other potential things that we could be doing with the technology that we have. One of them is leveraging location based technology. For example, if you’re on the strip and you’re walking around and we know you open the app, then we know which clubs that you’re closest to. We could send you an exclusive deal or package. If it’s close to your birthday and we know that information, we can ping you in advance with a push notification offering you a special from the club that has birthday specials. There’s definitely a lot that we can do with customer data and location data to help with hyper targeting. There are other app players out there, but our biggest competitor is Tablelist. There have been a few players in the past who have tried to build products like ours that have failed. One more recognizable name is I think is EZ VIP. They’re actually on shark tank and they got funded by Mark Cuban. A lot of these players in the past were just nightclub promoters who thought that because they could promote well, they could go out and build a technology company and do this but that wasn’t true. They didn’t invest enough in operations and building out the technology and making sure things worked.We, on the other hand, are approaching this from the product side as a startup should. Then we figured out how clubbing works while doing it. That was much more easy for us. Again, our biggest competitor’s Tablelist. They’ve actually raised between $3-$4 million and they’re based down in Boston. Their stronghold is really that Boston, New York area. We don’t really run up against them. They don’t play in the markets here on the West Coast and we don’t really see them run up against us in Vegas either. We’re really racing, I think, to displace promoters in whichever markets that we’re in.Unlike Tablelist, however, we are much more focused on the broader market for nightlife. As their name implies, Tablelist, they’re much more focused on the VIP, the table part, which again while it is a big business, it does not address a lot of the ticketing and guest list needs of the masses. We also have a partnership with Wantickets who is the largest ticketing provider in the nightlife space. They’ve been in business for over 15 years and we have relationships with a good number of clubs. I’d say most clubs in the country. Our partnership with them gives us access to their ticketing inventory which gives us a lot more ticketing inventory than they have. Many times, the inventory for Wantickets is actually exclusive as well. The team is comprised of three founders. All three of us are UC Berkeley graduates, class of 2008. I (Ian) graduated from Berkeley with a degree in industrial engineering and business, and then started my professional career at Banning Company which is a management consulting firm. My office was based in San Francisco. After two years there, I moved down to LA and joined a medium sized private equity firm called The Gores Group which I believe had between $4-$5 billion of assets under management. Spent about a year and a half doing traditional M&A due diligence, mergers and acquisitions and then from year 1.5 to 2.5, I transitioned to an operational role at a couple of their portfolio companies. Our CTO Ian Bushong is an electrical engineer computer scientist graduate from UC Berkeley. I think he’s a region scholar and he started his career at a company called Ambarella. They’ve since gone public. They do semi conductor chips and software for video processing hardware and their biggest customer is GoPro. Our third co founder is named Mark Wu. After graduating from Berkeley with degrees in business and economics, he joined Zeus which is the online dating company and there, he specialized in digital marketing, user acquisition and search engine optimization. As CEO, I handle most of the business development for the business. Mark who’s our COO does a lot when it comes to design and helps with product management. Ian Bushong, our CTO, manages the product and the technology. We’re bringing on another full time developer very soon who is the former co-founder and CTO of a tech incubated company called Planted that raised over a million dollars. We’re really excited to be bringing him on board because he’s got a lot of relevant experience and we think he can hit the ground running. Then we also have interns who help us with operations and marketing. We also have contractors who helped us with tech development products from time to time as well. Discotech Inc develops and distributes the mobile application, Discotech. Discotech is a free to download application on iOS and Android platforms that allows users to browse events, reserve tables, purchase tickets, and sign up for VIP guest lists at nightlife venues in different cities. Discotech is currently partnered with over 130 nightlife venues in Los Angeles, Las Vegas, Miami, San Diego, Orange County, San Francisco, and New York. We make it more efficient and transparent for our customers to make plans and enjoy a night out. Our company generates revenue from commissions we earn on table reservations, ticket sales, and guest list traffic that are sourced or transacted on our mobile application. In 2016, commissions from table reservations has comprised 76% of our company's net revenue. Guest list and ticket sales comprise 19% and 5% of our total net revenue respectively. In 2016 to date, we have generated approximately $153,000+ in net revenue off $1,350,000+ in gross merchandise volume. Our table reservation feature generates between a 10% and 20% commission on the gross spend of our end customers depending on the nightlife venue that we are partnered with. When a customer reserves a table on Discotech, we book the table on behalf of our customer with the nightlife venue, and then we follow up by providing confirmation and instructions to the customer. The customer ultimately checks in at the venue under their name, and pays for the table at the venue. 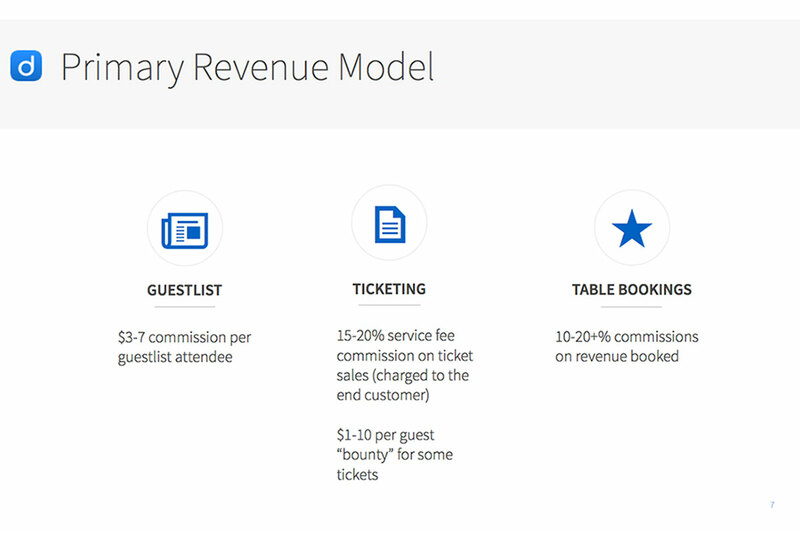 (You can think of this service as "OpenTable for Nightlife") For payment, Discotech receives commission from our venue partners based on a percentage of our customer's gross spend. For ticket sales, Discotech handles the transaction directly on the platform. We sell tickets at face value + service fee to our end customers, who receive a digital ticket and QR code which they can use at the door to gain admission to the event. Discotech returns the face value portion of the ticket back to our club partners, and keeps the service fee as our commission for the transaction. Our ticket prices are always less than or equal to the price of tickets that are available directly on a nightlife venue's own website. Lastly, for guest list admission, we allow customers to add their names to a club or lounge's VIP guest list. At the venue, our customers can check in with their first and last name to receive free or discounted admission to the event. For generating this foot traffic, our venue partners pay us between a $3-$5 commission for every guest that checks in via our guest list. In the immediate future, we expect to see continued growth through the summer season. We expect to see our performance slow in the Winter of 2017, before expanding significantly in the Spring of 2017. (We have seen this pattern in the previous two years we have been in business) In addition to the strong organic growth that has been gaining momentum month over month, we believe that a future catalyst to our growth will be the launch of our web app product. Currently, our website is purely a lead generation platform to our Discotech mobile app. Visitors to our website are unable to create accounts, reserve tables, or make transactions on the website. To date, we are seeing over 2x as many unique visitors to our website compared to our mobile app. We believe the launch of our web app will result in a step function increase to all of our key performance metrics. Through the next 2-4 years, the management team forecasts continued YoY growth as we expand our app to new cities domestically and internationally. 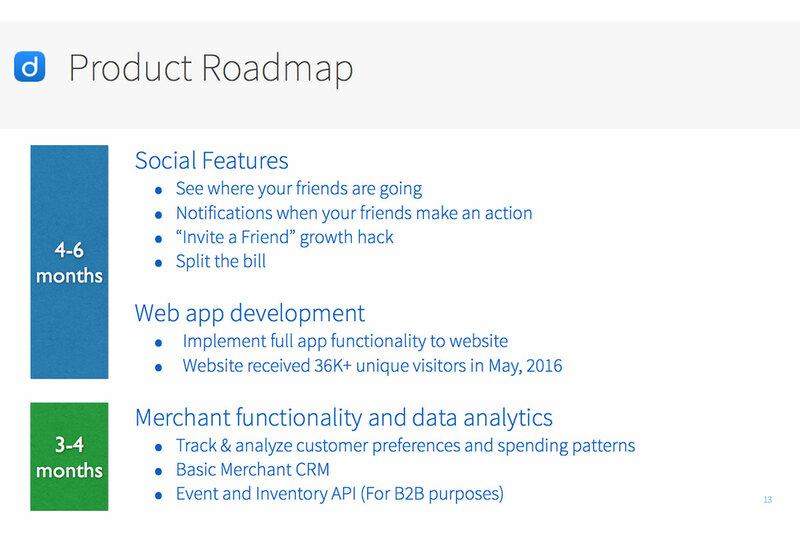 We also believe that new feature releases will be a source of continued growth and monetization. While the team is relentlessly focused on growing the business, our ultimate goal is to sell the company to a strategic buyer when the timing and opportunity are right. Economic downturn - Discotech, along with the nightlife industry, are susceptible to changes in discretionary spending and broader macro-economic shifts. Competition - Although the industry does not currently have any strong technological players, we could see this shift over time. Additionally, it is possible that a larger player from an adjacent market (such as OpenTable or Priceline) may enter into our space. While we think that these players are more likely to acquire players, there exists a non-zero chance that they decide to enter the space organically. Legislative Changes - Any legal changes surrounding alcohol consumption or nightlife regulation has the potential to negatively impact our business. Talent/HR - any significant changes to our management team or developer team would have a significant impact on the productivity of our business. Discotech currently has $172K in cash, $21K in accounts receivables, and $2K in current liabilities. The Company's networking capital is $191K. We are not currently burning cash on a monthly basis as our gross profit surpasses our expenses. We do not enter into investments for trading or speculative purposes. Our policy is to invest any cash in excess of our immediate requirements in investments designed to preserve capital and provide liquidity. Accordingly, our cash and cash equivalents are invested primarily in demand deposit accounts, certificates of deposit and money market funds that are currently providing only a minimal return. We anticipate using our available cash and the proceeds of this offering to expand our team and to invest in user-acquisition. Our most pressing hiring needs are for software developers and full time customer service/business development employees. Additional cash in the war chest will be used to acquire additional users via digital marketing, promotions, and SEO improvements. Discotech has a very disciplined and bottom-line focused management team, and we do not anticipate running our business with a burn rate which would put our company at risk of running out of cash. Although the proceeds of this offering are not necessary to the viability of our business (we are already profitable), it will be integral for: 1) Developing a functional web app, 2) Developing new features to our mobile application, and 3) Expanding to new geographies. We believe that building a new product line, improving our existing technology, and expanding to new cities will result in significant growth to all of our key metrics. Ultimately, we believe that this investment will have a positive ROI in the form of greater positive cash flows, and a boost to our multiplier when we exit the business. Our cash held as of July 25, 2016 is 84% greater than cash held as of the same date in 2015. This increase resulted primarily from new investments (new convertible notes and SAFE notes issued) and improvements to our business operations in 2016. We saw our cash position decline between July 2015 through February of 2016 since we had not yet achieved cash flow break even. Cash flow from the Company's operating activities are derived from net income/losses and changes to our accounts receivables. Net cash provided by operating activities was -$133,433 for the year ended 2015, which was driven by a net operating loss of -$104,910 and a $28,523 increase in accounts receivable. Net cash provided by operating activities was -$121,096 for the year ended 2014, which was driven by a net operating loss of -$117,623 and a $3,473 increase in accounts receivable. We have financed our operations over the past few years through convertible notes that we issued in 2013 and 2014 to the sum of $405,000. In March of 2016, our business operations became profitable, so we are also funding Discotech now through the cash flow that is being generated by our core business. Discotech does not currently use, and has never used a revolving loan facility or bank loan - we do not have any long term debt. Operationally, our total net revenue increased by $81K, or 227%, from 2014 to $117K in the year ended 2015. This increase was primarily driven by an increased customer install base, which increased by 160% from the prior year (14,892 at year end 2014 to 38,780 at year end in 2015). We have enjoyed our fastest growth in 2016. We have generated over $60K in net revenue in the months of May and June combined, and we are expecting to drive $40K in the month of July. We expect these trends to continue in the current fiscal year and in the coming few fiscal years. 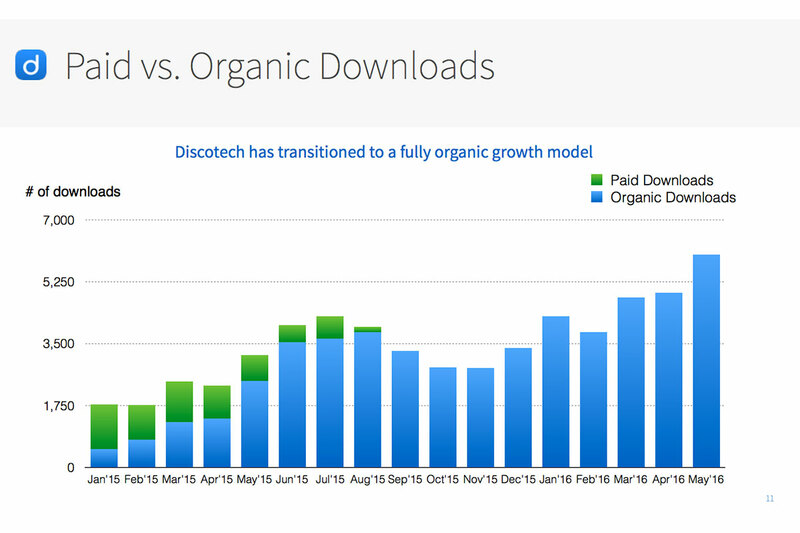 The key driver to our growth stems from the number of new users that we are able to onboard onto Discotech. In 2016, we have seen our new downloads skyrocket through word of mouth and other organic channels. As our user base continues to grow, the virality of our product grows alongside it as there are now more people to share the app with new potential customers. Furthermore, Discotech is constantly investing in our product and developing new features that will improve our customer experience. We believe that this will result in greater virality of our product, higher engagement rates, and greater monetization over time. As mentioned before, we believe that the launch of our web app product will be a significant boost to our business as it will allow us to target customers who are not looking to download a new app to book a night out. 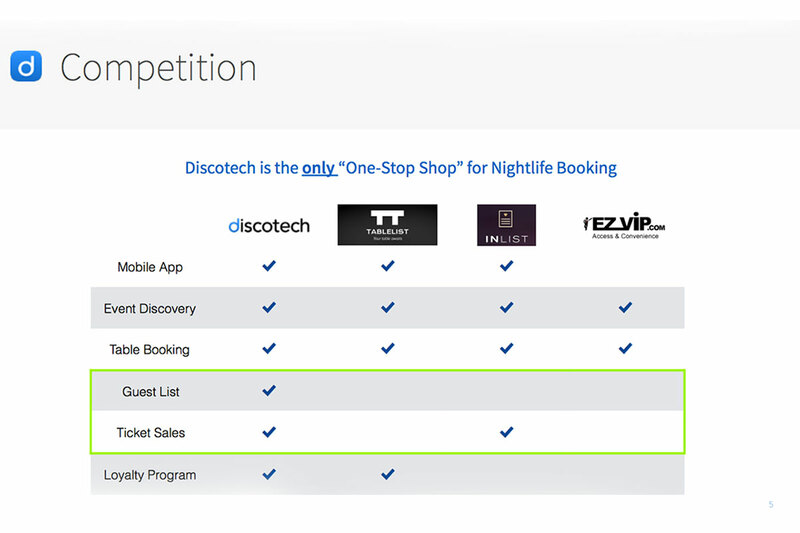 Over the past few years, we have demonstrated that there is a clear need for our product in the nightlife industry, that our customers love Discotech and are actively sharing it with their friends, and that we can generate revenue in a profitable manner. I believe that our team will drive consistent growth into the future, and additional capital will allow us to make smart investments that will supercharge our business. 1 1. Economic/Market Risks - Although the nightlife industry has been on a steady rise over time, it is susceptible to broader changes in the macro-economic environment. Because nightlife is often associated with the luxury and discretionary spend category, significant declines to the domestic/global economic health could reduce demand for nightlife spend. 2 2. Competitor Risk - There is a risk that larger reservation platforms such as OpenTable or Priceline could enter into our space. (We believe they are more likely to acquire into this space rather than start from scratch, but its a possibility) Furthermore, Discotech competes with other start ups that are also competing to disrupt the nightlife space. 3 3. Talent Risk - A key assumption to our growth is the ability to hire and bring on talent that will help us improve our product, operations, and marketing. Finding the right employee fit for Discotech takes time, and a delay in the recruitment process could hinder our growth. 4 4. Privacy Risk - Discotech stores customer data on our servers. While we treat this data with the utmost importance and take measures to safeguard this data, there exists risk of data breach / hacking that presents itself as a risk to our business. $100,000 1. Hire full-time software developer to support our development of web application and new features for the app. Discotech is the one nightclub app that has shined for us, and are so easy to work with! They produce what they say they will, and have established a great network for promotions and tables. They communicate well, are on top of all of our events, and have the knowledge of events and clients that I haven't seen with anyone else. And, they bring clients and guests! We have had nothing but great experiences with Discotech and look forward to our continuing relationship with them. Ian and the Discotech team are some of the brightest entrepreneurs I have ever come across. The journey that they share living and working together in San Francisco, Las Vegas, and Los Angeles is truly inspiring. They have demonstrated perseverance and resourcefulness that gives me great confidence that they will be successful no matter what obstacles come their war. Boss and mom. Dabbling in small investments, REIT's, and 401k. Just started investing last year. Very new. Founder and CBO of The Wark Group. I am an IT professional working in Atlanta. Excited to be an investor in early stage companies like Discotech. Hi guys! Can't wait to see Discotech grow! I posted on FB which every person involved needs to do! The AP has so much potential but needs to be seen and used! This would have been huge when I was still in the scene! Good luck! Good luck fellas. I think you are all very smart young people and I like your story. I live in NYC. While not really into the club scene, I can see this being a valuable tool. Will test it out sometime soon. Good luck! Good day, My name is Zachary and I just invested in your idea and I look forward to your success. As a tech nerd myself I am obviously interested in all things technology. The opportunities unleashed thanks to ever evoling technology is truely a blessing. I await to hear about your future endeavours. Thank you for letting us be apart of this and God Bless. Hello, This is Anish and I am a software engineer. I love the idea of this business and I personally think you guys are doing great with this. I wish I can be more help to you guys. Strong Believer of Disruptive Thinking !! Ardent Believer of Disruptive Thinking./. Hi guys, it's great to learn more after retiring! Upon completion of my goal, I will contact you soon. Thanks. The following interview is with Ian Chen CEO of Discotech, the company that created Discotech Nightlife. Tell us a little bit about your company Discotech is essentially your virtual nightlife host. Our mobile app allows users to discover events, reserve bottle service, purchase pre-sale tickets, and sign up for VIP guest lists at nightlife venues in different cities. 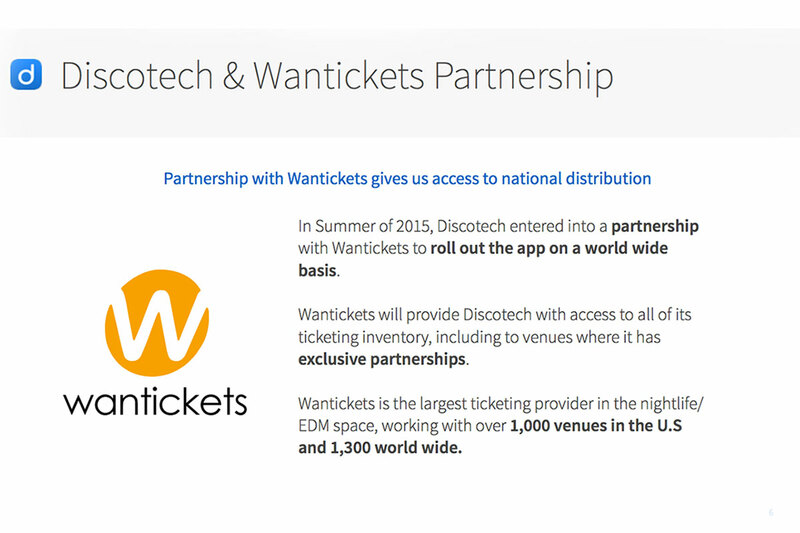 Online ticketing provider Wantickets has announced an exclusive partnership with nightlife app Discotech that will allow users to purchase tickets directly in the mobile app on their Android or iPhone devices. Founded in 2012 by three UC Berkeley alumni who were tired of being exploited by club promoters, Discotech serves as a one-stop "virtual concierge" that helps users find events, buy tickets, book tables, and RSVP for guest lists. Discotech is the free mobile nightlife app that allows users to browse events, request VIP & bottle service, purchase tickets, and explore nightlife in their area Want to enjoy a night out, but want to avoid all of the unnecessary hassles associated with a night on the town? Well, fear no more. It's silly to try to do and learn everything yourself, learn to surround yourself and rely on others to help you along the journey! Ian Chen was born and raised in the suburbs of Potomac, Maryland. Growing up, Ian was always a bit of a geek. Discotech's mission is to bring transparency and efficiency to the grossly outdated nightlife reservation space. The team is new to the Las Vegas tech community. Discotech is the premier nightlife app for customers to browse events, sign up for guestlists, and book tables at their favorite clubs. 21 Jul 2014 Posted by admin NNightlife: a ritual governed by uncertainty. Methodical showering, dressing, primping. Scouting a swank spot. Waiting in line to pass muster with the gatekeeper. Maybe getting in if you are one of the chosen few or, if you are not, walking away disappointed with your tail between your legs. Fans of the growing nightlife app genre have one more option to choose from on iOS, as Discotech has announced the launch of its app of the same name. The app allows users to browse local clubs, see which DJs are playing, sign onto guest lists, book tables and more, eventually earning loyalty points for the money they spend.